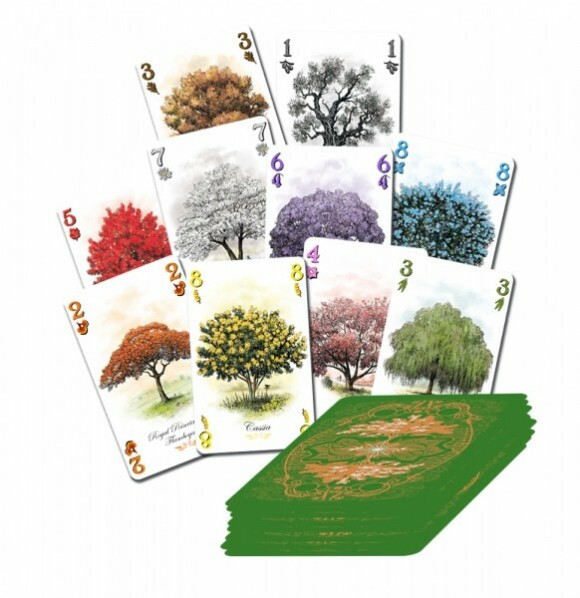 Arboretum is a gorgeous little card game where players take turns drawing cards and adding trees to their very own arboretum. – Beautiful, appealing artwork and high-quality cards. This game looks great on the table as players create their respective arboretums. – Scales nicely depending on the number of players (although playing with three or four players provides more inherent tension during a session). – Lots of hidden depth. On the surface, players are simply building paths of trees using cards of ascending value. It doesn’t take long before a pleasing “brain burn” sets in, however, as numerous options open up to the players. Do you discard a maple tree and risk letting an opponent pick it up on their next turn? Do you hold on to a lilac tree worth 7 points in order to use it at the end of the game to prevent an opponent from scoring their lilac path? What if that lilac card takes up room in your hand that you would rather use for building out your willow tree path? You need to play a card, but you want to save your cassia trees, so that means you have to waste this jacaranda card worth 6 points… You get the idea. – Scoring is unique and a bit fussy to learn. – Can be too complex to use as a quick and dirty filler. I’ve seen eyes glaze over as I try to explain the endgame scoring methods. – Requires a fair amount of room (building out your arboretums can take up a lot of table space with four players), so playing it on a plane or in the car on road trips is difficult/impossible. Arboretum has some of the most beautiful artwork I’ve ever seen in a card game, and the cards themselves are a pleasure to hold. Once you get past the unique way to score, gameplay is a pleasingly crunchy mix of playing and discarding the right cards at the right time, along with holding onto cards that will come in handy only when the game ends. Just don’t expect this to be a light filler you can throw on the table between heavier games. It holds its own with surprisingly rich and satisfying gameplay. Add a Review for "Arboretum"